In this article, we examine the what, where and how people play FOW/TY. Painting is a big part of the hobby. Unlike other miniature systems, FOW/TY players take their painting quite seriously. This is some good news for store owners. Please keep continuing supporting your local game store. 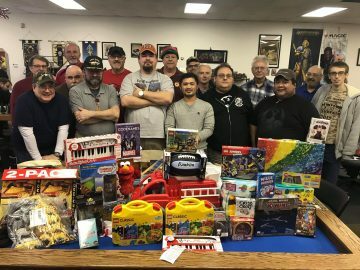 This why we should support our local gaming store. Where else would you play? Another example of why we should be supporting our local game store. We all play there enough. If I can hazard a guess, the breadth of options (read: toys) of Late War makes it the most appealing. At the time, this question was asked with a version 3 mind set. In version 3, your the list you selected set the tone for the rest of your formation build. With version 4 being a combine arms game, does your primary formation still have the same impact? We had a good idea that the big four would be the top four, the question was, in what order would they fall. While the bad guys took the top spot, we are little surprised that the British tied for second. Multiple choices were allowed for this question. 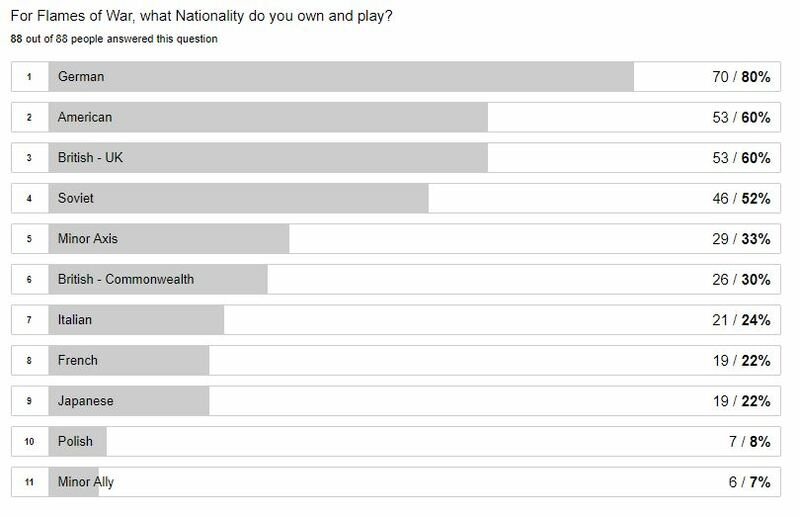 Seeing that the survey was taken last September and 4th addition was only out for six months, a majority of people were already on board. When the survey was taking place, it was at the back end of the British “Scout Tank” card debate. With no one response ahead of another, it appears, at the time, the jury was still out regarding cards. 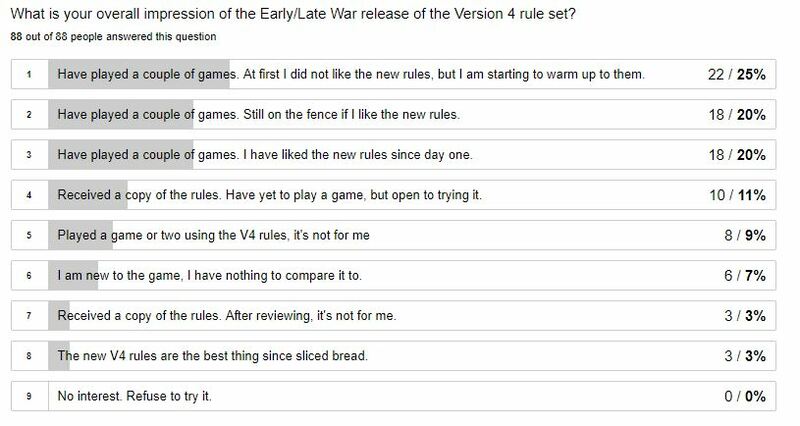 When this survey took place, the first version of Battle Plans was just released. 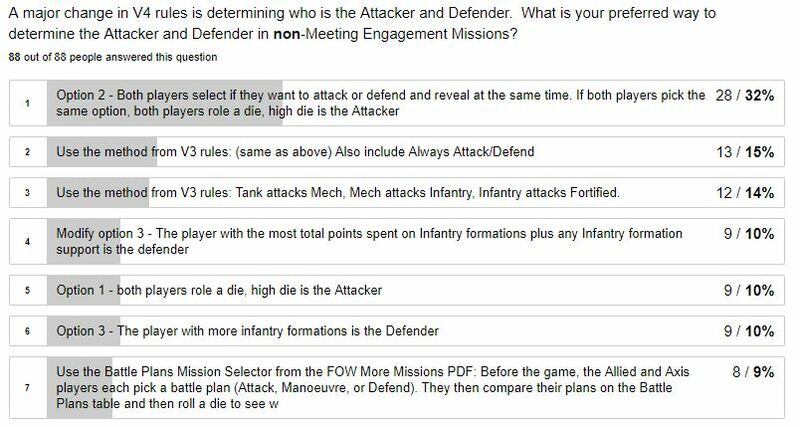 While the updated version of Battle Plan was in improvement, we wonder if the survey was to take place today if Battle Plans would rank higher. Once again we allowed for multiply selections. 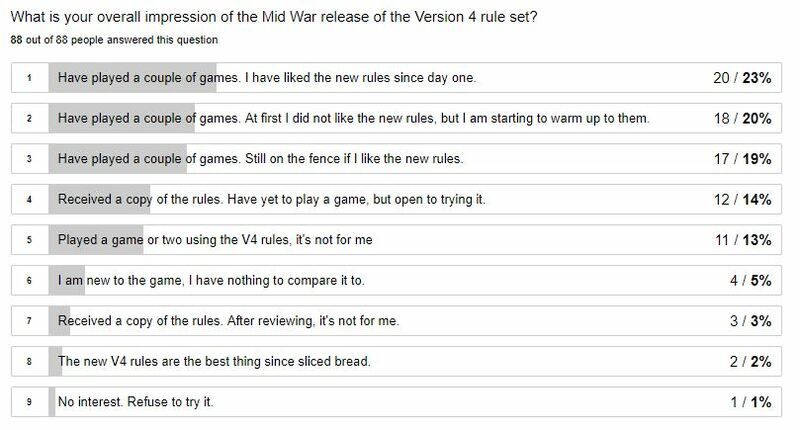 For most, the Flames of War site and Forums are the go to places. With WWPD closing down, there is a hole to fill. I wonder who will step up? Looking at the replies, people just like to play the game. We know Rankings is not the be-all end-all of the FOR/TY tournament scene, we where wondering where we ranked in players minds. Prior to 2012, there was a 12 player minimum in order of the tournament to count towards rankings. Starting in 2012, when the current Rankings system was rolled out, the minimum player requirement was not put in place. One of the factors on why was Battlefronts removal of needing to “qualify” to play in a BF nationals. Rankings is not thinking of bring a minimum back, we want to hear from the Community. Now that we have are own dedicated site, we have vehicle to promote Rankings to the masses. 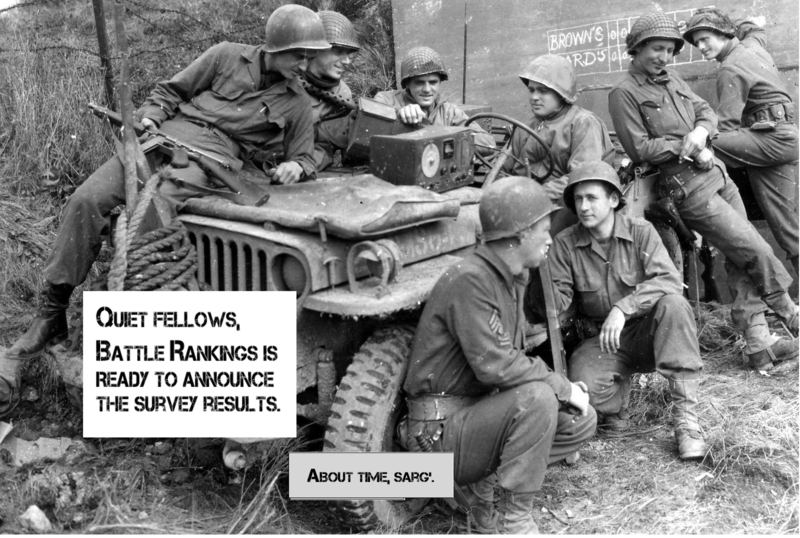 Hopefully we at Battle Rankings can move the needle in our next survey. After our programmer graduates this May with his doctorate degree, we will tackle some of the above items. When we first made the announcement regarding doubles tournaments, there was some blowback. The data shows that it was a good decision while having little to no impact on attendance of double tournaments. For all of you who took part in our first attempt at a survey, thank you. We are planning on doing this every year around September/October. Leave us a commit or post on the Battle Rankings forum your take of the survey.